Egypt's Interior Ministry announced on Saturday that it had killed 40 terrorists in a raid on three hideouts in Egypt's Giza and North Sinai governorate, a statement by the interior ministry read. The ministry highlighted that the raid was carried out at dawn on Saturday targeting terrorists who have been planning to carry out hostile acts during Christmas celebrations. According to the statement, 14 were killed in the 6th of October city in Giza governorate while 16 others were killed in a residential area at the Al-Wahat Al-Baharia road near Giza governorate. The statement added that 10 others were killed in Egypt's North Sinai city of Arish. Large amounts of ammunition, firearms, improvised explosive devices were found inside the terrorists' hideouts. The Interior Ministry said that "this comes as a continuation of the ministry's efforts in chasing terrorist elements involved in the implementation of hostile operations seeking to destabilize the country's security." "Information was available to the national security sector about the preparation and planning of a series of terrorist attacks targeting state institutions, especially economy, tourism industry, armed forces, police and Christian houses of worship," the statement read. 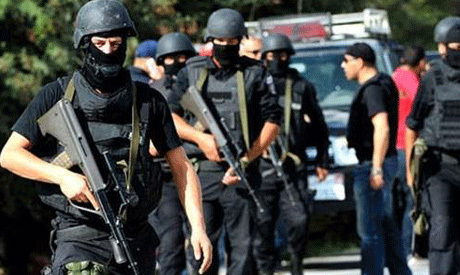 The ministry immediately dealt with this information and directed several security raids to the governorates of Giza and North Sinai, following the authorization of the Supreme State Security Prosecution, the statement concluded.